Sideline Robot Helps Trainers Spot Football Concussions : Shots - Health News It's common for some clinics in rural America to consult medical specialists by video for difficult cases. Dartmouth is testing a robot that connects trainers to a neurologist who is miles away. Go Big Green! 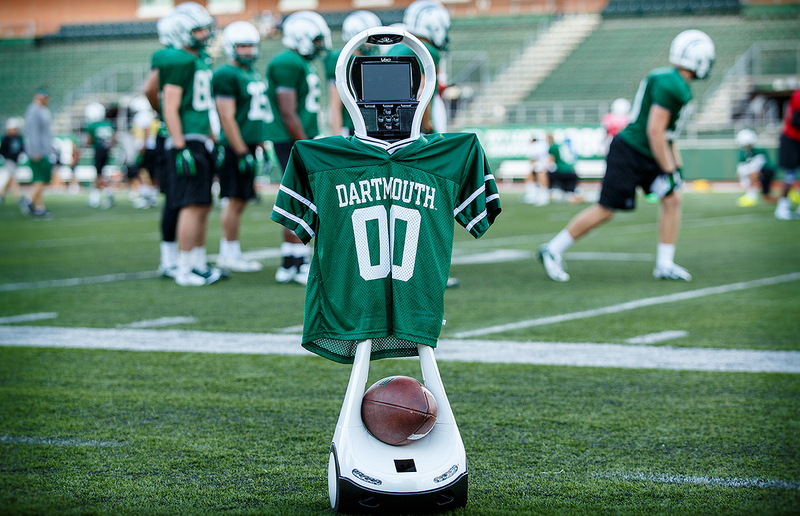 Dartmouth is testing the VGo robot to help diagnose concussions when neurologists aren't at the game. With the fall season come littered leaves, new television lineups and the sport that can't stop stirring up controversy: football. Rolled out (literally) in partnership with Dartmouth-Hitchcock's Center for Telehealth, the robot, called VGo, looks like a 4-foot-tall popsicle stick on wheels, with a screen and camera up top. It allows a brain specialist from miles away to help certified athletic trainers figure out if a player might have a concussion, and what should happen next. "I would say an athletic trainer can probably manage 80 to 90 percent of the cases that he or she sees," says Steve Broglio, director of the Neurosport Research Lab at the University of Michigan. But some difficult cases could benefit from having a quick consult with a concussion specialist like a neurologist or neuropsychologist, he says. For example, a player who is coming in and out of consciousness, or who seems to be having mental problems, could benefit from a quick, deeper evaluation, says Broglio. But not all high schools and colleges have certified athletic trainers on hand during every practice and scrimmage, let alone a brain specialist. That's where remote help could come in handy, the makers of VGo believe. With VGo, a school could have "a virtual presence on the sidelines — essentially one doctor could be on the sidelines of a dozen games all at the same time," says Sarah Pletcher, director of the Dartmouth-Hitchcock's center. If VGo works for the Dartmouth football team, Pletcher says, it could potentially be used for other contact sports — hockey, basketball or lacrosse, for example — and by schools that don't have the budget to staff various games and practices with medical professionals. Getting a medical problem diagnosed by someone who's not in the same room isn't new. Kaiser Permanente, one of the nation's largest nonprofit health plans, says that in 2013, 35 percent of the "visits" to primary care providers at Kaiser happened by email, and 15 percent were over the phone. 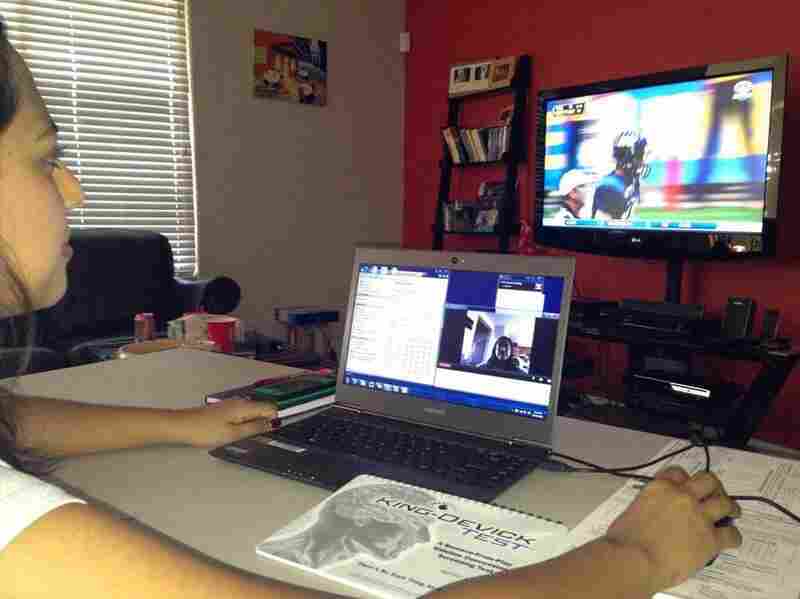 However, not all health professionals are sold on telemedicine's effectiveness. A 2010 review of 80 telemedicine studies found that 20 concluded it was effective, 19 said it was promising but in need of more research, and 22 said evidence is too limited to be definitive. A video call by smartphone or electronic tablet would be cheaper and even more mobile than the robot, some might argue. But Dr. Bert Vargas, a neurologist at the Mayo Clinic in Arizona who has been involved with some preliminary testing of VGo on the football field, says that, unlike a phone, the robot doesn't require an extra person to hold the camera up to the athlete. And the robot's movements are controlled remotely by the specialist, who can pan and zoom as needed. Whether Dartmouth's robot works better than a smartphone for a concussion consultation is still an open question. Vargas thinks the device also might eventually prove useful for remote monitoring of games or practices when athletic trainers can't be on hand. But not everyone is convinced the device will ever be that sort of substitute. "There are a lot of things you can't deduce through a computer screen," says the University of Michigan's Broglio, like watching a player on the sidelines (or later, in class) for any change in personality, which can also be a sign of concussion. "It's good," Broglio says, "but it's an adjunct at this point."